General Hospital (GH) spoilers tease that Cameron Webber (William Lipton) will run into some trouble. He’ll find himself in a tight spot on a new GH episode Tuesday, February 12, but that’s obviously the last thing he needs right now. Cameron is supposed to be staying on the straight and narrow, but we all knew that’d be difficult for this rebel. GH fans will recall that Cameron got the bright idea to buy some weed for Oscar Nero (Garren Stitt). Oscar didn’t have much of an appetite thanks to the clinical trial, but he needed to keep his strength up. Cameron thought some pot might help, but he ultimately wanted to back out of the deal. Sadly, Cam couldn’t talk the drug dealer out of it, which led to an arrest and a tough day in court. Now Cameron’s on probation for 12 months. He has to complete drug counseling and a community service program as part of his sentence. If all goes well, Cameron’s benevolent mistake won’t go on his record. However, the jam Cameron lands in could put the whole plan in jeopardy. Elizabeth Webber (Rebecca Herbst) is counting on Cam to behave, but trouble seems to follow him everywhere! 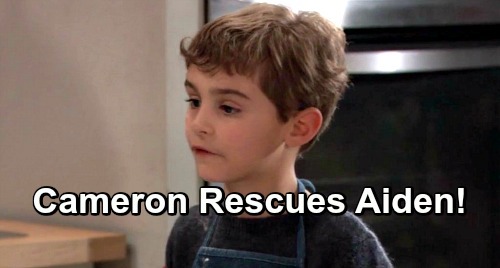 General Hospital spoilers hint that Cameron may panic over his next ordeal. Will it have something to do Aiden Webber (Jason David)? Cam knows that the other kids call his brother “Gayden” and make fun of his hobbies. He wants to look out for Aiden, so he may end up rushing to his defense. Of course, Cameron wouldn’t go too far with a bunch of third graders. He’d just let them know it’s not cool and offer a stern lecture. If the bullying spirals out of control, Cam may not be able to stop himself from intervening. It’s clear that he cares about his little bro a great deal. Whether the abuse remains emotional or turns physical, Cameron can’t stand by and let Aiden get hurt. Since Aiden’s got a big brother to watch out for him, you can bet some of the other kids have big brothers, too. Those brothers may not appreciate Cameron scolding their siblings if that’s where this is headed. It’s one thing to reprimand some kids. It’s quite another to get into a brutal brawl with other teenagers. That could spark another arrest and wreck Cameron’s probation. Cameron might avoid punishment if he didn’t fight back, but that doesn’t sound like much fun either. He may find himself stuck in turmoil no matter what! We’ll give you updates as other General Hospital news comes in. Stick with ABC’s GH and don’t forget to check CDL often for the latest General Hospital spoilers, updates and news. General Hospital Spoilers: Jasper Jacks Returns To Port Charles – Jax Helps Josslyn Deal With Oscar Drama?